What a beautiful Easter Sunday we had! Thankfully, we will keep the sunshine around all the way until late week. Expect lows tonight to head into the mid 40s. 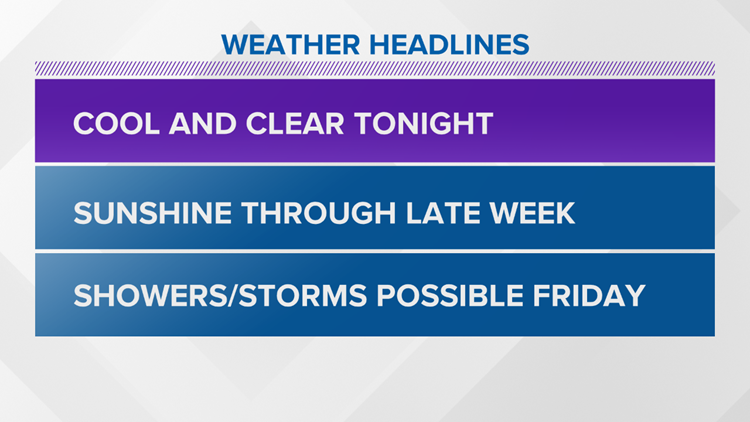 As of now, this next system that will knock on our door Friday should not carry with it a severe threat, but we will continue to monitor it as we head through the work week. Overnight lows tonight will head into the mid 40s under clear skies, and tomorrow we bring back lots of sunshine, and highs will head near 80! Sunday Night... Clear. Lows in the mid 40s. Thursday...Partly cloudy. Highs in the low 80s. Friday... Mostly cloudy. Showers and storms possible. Highs in the upper 70s. Saturday... Mostly sunny. Few showers possible early. Highs near 80. Sunday... Mostly sunny. Highs in the low 80s.